Nothing on shortwave? I still disagree. In that article, I posted recordings made on the 31 meter band of eight different broadcasters, all of which I found within a 250 kHz chunk of bandwidth on a Friday afternoon. On February 8th (this past Saturday), I recorded a 160 kHz chunk of spectrum on the 31 meter band with my WinRadio Excalibur, starting around 1:00 UTC and lasting for about 9 hours. I made this spectrum recording in attempt to capture the Voice of Korea on one of their three scheduled frequencies. Though not logged, I also heard Radio Havana Cuba, China Radio International, WRMI, China National Radio, WWRC, Deutsche Welle, Voice of Korea (faint) and many others. I’m guessing that I only logged 50% of what I heard as this list was put together from a quick scan through the recording. In fact, I’m systematically making recordings of each of these broadcasts, from the spectrum file, and adding them to the Shortwave Radio Audio Archive. I may actually discover more stations in the process. My point is, if you think there’s nothing to listen to on shortwave, you’re simply not listening! This entry was posted in Broadcasters, International Broadcasting, News, Recordings, Schedules and Frequencies, Shortwave Radio, What's On Shortwave and tagged Is Shortwave Radio Dead?, Is there anything on shortwave?, Is there anything to listen to on shortwave radio?, Shortwave Radio Recordings, What to listen to on shortwave, What's On Shortwave on February 10, 2014 by Thomas. To respond to above post abt swl – the ptoblem isn’t price of equipment or only loss of broadcasters but the FCC and Industry Canada refusing to protect our RF spectrum in the MW to HF band- and higher – from the crap from China that spews digital hash into the the RF bands- I am talking about unintentional radiators like cheap wall wort switch mode power supplies that , for a few cents more, could be RF quiet. Instead the band is poluututed with bussing and rasping and plasma TV’s that make everything except the strongest of signals get burried in an RF swamp of digital hash! Interesting post. The problem with shortwave radio as a hobby today is not that it is dying, it is that the audience is loosing interest for a number of reasons, and I believe they are all related to cost. First, you have to consider that the shortwave business (by this I mean manufacturers of radios, antennae, etc.) thrives on the average user with mass purchases. The average user is not the person who buys a $500-$5000 communications receiver and a $500 antenna, plus some change worth of equipment. The average user will buy the average radio, and by average I mean those portable units out there that cost $50 to, at the most, $300. Now consider what’s happening to the main stations that broadcast with enough power to reach the average user: they are dropping like flies. So, then, the average user is left with an average (and often below average) radio that is mostly good for picking up the 500Kw broadcasts which, as I’ve said, are less and less. Everyday the average user turns the radio knob and finds less quality broadcasts and more fundamentalist religious junk that seems to be about the only thing that’s easy to pick up with “commercial grade” equipment. There is a lot of stuff out there on shortwave, but with what I described above you are forced to get a complicated antenna system and a prohibitively expensive receiver so you can actually pick up, with a degree of quality, what’s out there, because what’s out there isn’t usually beamed directly to places like U.S.A. Consider, then, that in order to hear stuff that was previously easily available requires equipment that, on top of being expensive, has to be purchased online only, long gone are the days when you could go to Radio Shack or Best Buy and pick up something. Cool, you drop all that money and get something decent, what do you then hear? broadcasts with poor quality or hams repeating, over and over, “whiskey papa kilo charley, qsl qsl qsl.” Is this something the average listen would want to spend a small fortune to catch? certainly not. So, yeah, shortwave is still alive and well, people just don’t care enough to drop a large sum of money when the internet is available. 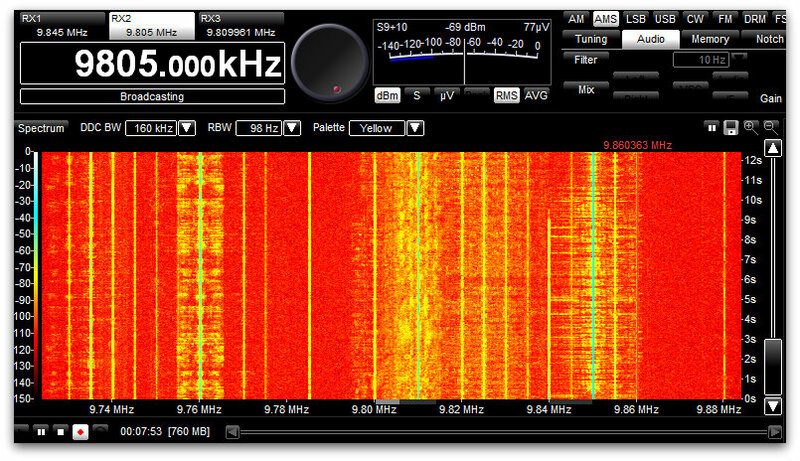 Could you post the full RF file somewhere (I know it will probably be big) for others to listen to via HDSDR or similar? I wish I could, Stephen. I have the Excalibur break the file up into 2 GB chunks. I think the total size is in excess of 50GB. My dream is to make a space where spectrum recordings could be shared online. Unfortunately, I need to time travel into the future a few years. Due to speed, bandwidth limitations, and sever space–it’s a very pricey venture.